Pictured at the check presentation ceremony are:  Byrl Moore (President of the Board of Directors and Westside Volunteer Driver), Nancy LaForest (member of the Board of Directors), Ed Vigil (Chair of the Volunteer Advisory Council and Volunteer Driver for Northside and Westside),  Shauna Frost (Executive Director), and Annam Manthiram (Development Director and Northside Volunteer Driver). 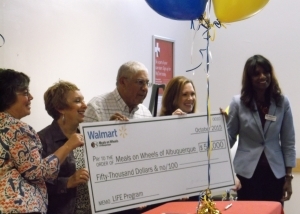 On October 14th, 2015, an enthusiastic and grateful group of MoW volunteers, employees, board members, and other guests convened for the first ever Walmart Foundation Check-Cutting Ceremony. The Walmart Foundation generously donated $50,000 this year to our LIFE program, and the ceremony was to honor the foundation’s life-changing philanthropy. “Meals on Wheels started in 1972 serving just 20 meals in Albuquerque. Since that time, the organization has served over 3,000,000 meals. In just the last year alone, 122,000 meals were served.” The crowd erupted in applause over the organization’s remarkable progress. Serves anyone of any age. In fact, a quarter of our clients are under 60. Designs and delivers up to seven types of medically-tailored meals for various health conditions. Does not receive state or federal funding. We rely on the generosity of individuals, foundations, and businesses such as Walmart to keep feeding those most vulnerable. The Walmart Foundation’s grant directly supports our LIFE (Low Income Food and Enrichment) clients. The name reflects the life-sustaining nutrition and life-changing hope it provides for the poorest and sickest in our community. 7,600 chances to change someone’s life for the better. The life-affirming impact that Meals on Wheels of Albuquerque, its meals, and its volunteers have on its clients is immeasurable. Ed Vigil, a volunteer driver and chair of the Volunteer Advisory Council, followed Shauna and gave a delightful speech about his experiences as a volunteer and the people he meets and serves. He shared how his service to others has impacted his life and others in a positive and uplifting way. Delicious refreshments were served to all in attendance, and a large check printed with the Walmart Foundation’s generous grant was signed and handed over ceremoniously to Shauna and Ed.